One of the things that characterizes the Cuban people is the high cultural level that we possess. Cuba is a fully literate country with a high level of education and professionals. 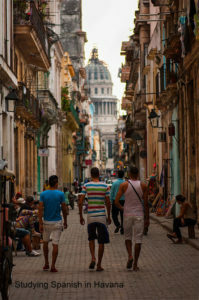 Studying Spanish in Cuba is a good option, but to learn Spanish in Havana is the best idea. This way you can combine tourism with learning. To learn Spanish in Havana is to know one of the seven wonders of the world, where time seems not to have passed, is to take a trip in time, is to be in the present, but living the past, is to walk through its cobbled streets, admiring its facades still painted with the same varnish from its construction, talking with period characters that are wandering in the squares, is to enjoy a ride in classic cars of the forty or in carriages of colonial Havana and of legendary cabarets that revive the glamor of other times. The beauty of its historic center, declared a World Heritage Site by Unesco, is one of its main attractions, a display of colorful colonial architecture, majestic fortresses and cobbled streets, among which art galleries, shops and bars have found their space, Tainting the area with a seductive bohemian identity. 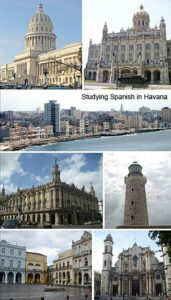 To learn Spanish in Havana is to mix knowledge with fun, learning with relaxation. 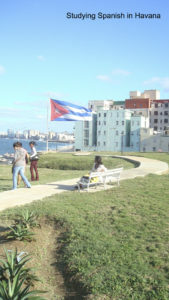 It is to study in open spaces, in the squares, in the gardens, in a cafe, on the Havana boardwalk, a wall that really helps us to find that inner peace that we are all looking for. To learn Spanish in Havana means not only knowing a language, but also knowing a culture full of mysteries, joys and sorrows, dreams and hopes. Through Spanish you can enjoy that Havana hidden for foreigners, but so special and common for Cubans. Speaking the same language as the Habaneros is to admire and discover a city that refuses to forget its roots, is to walk, enjoy, feel like Cubans. You arrive to Havana as a tourist and you leave like one more habanero. Posted in Blog and Tagged Cuba, Culture, Havana, Language school, Learn spanish, learn spanish in Cuba, spanish classes in Cuba, Spanish courses, Spanish school.